Robert Graham Bradley was born in Washington D.C. on 26 September 1921. He was appointed to the U.S. Naval Academy on 9 June 1939, and graduated with the class of 1943 on 19 June 1942, due to the exigencies of war. From 3 July to 27 October 1942, he underwent instruction at the Atlantic Subordinate Command, Service Force, at Norfolk, VA, before he reported to the New York Shipbuilding Corporation, Camden, NJ, on 29 October to assist in fitting out the fleet carrier USS Princeton (CVL-23), which was ultimately placed in commission on 25 February 1943. While serving on that ship, he received promotions to Lieutenant (junior grade) and Lieutenant on 1 May 1943 and 1 July 1944, respectively, and took part in every operation conducted by the ship ranging from the occupation of Baker Island (September 1943) to the Battle of Leyte Gulf (October 1944), in which the ship was lost. On 24 October 1944, PRINCETON was operating of the coast of Luzon, in the Leyte Gulf, about 150 miles east of Manila, when a Japanese dive bomber attacked her, releasing a single bomb that penetrated the flight hangar and main decks and then exploded, touching off a conflagration that soon had the carrier's entire hangar deck ablaze. A series of explosions then rocked the ship. Lieutenant Bradley, PRINCETON's Assistant First Lieutenant, led a repair party in the valiant effort to control the fires on the second and third decks until the intense heat generated by those flames forced him and his men to fall back. After ensuring that no wounded men had been left behind during the abandonment, Bradley followed his men into the water at about 1005 and was picked up by the destroyer MORRISON (DD 560) soon thereafter. Shortly before 1300, Bradley left MORRISON and rejoined his ship and the efforts to save her. Unfortunately a submarine and air alert at 1330 drew off BIRMINGHAM (CL 62) and MORRISON -- the two ships then alongside -- to assume screening positions, at a time when the fire was almost totally under control. The persistent blazed flared up. With renewed vigor MORRISON and BIRMINGHAM attempted to renew their efforts alongside PRINCETON getting a line onboard the carrier at about 1515. Shortly thereafter, at 1523, the flames touched off a mass detonation of four hundred 100-pound bombs stowed aft in a torpedo magazine in PRINCETON. This explosion literally blew off the carrier's stern, killing Bradley and every man in the repair party that had been in the vicinity. Bradley had repeatedly risked his life, entering the most dangerous areas below decks to ascertain the extent of damage and to fight the fires blazing onboard ship. For his outstanding fortitude, great personal valor and self-sacrificing devotion to the completion of an extremely perilous task, as well as his extraordinary heroism in the line of duty, Lieutenant Robert Graham Bradley was awarded the Navy Cross, posthumously. The Shield: Gold and dark blue are the colors traditionally associated with the Navy. The winged anchor refers to Lieutenant Bradley's services onboard the light carrier USS PRINCETON during World War II. The flaming Chief symbolizes the damage inflicted upon USS PRINCETON by an enemy air attack during the battle of Leyte Gulf and the resulting fires which eventually claimed the life of Lieutenant Bradley as he valiantly led a crew in the effort to extinguish the flames and save the ship. 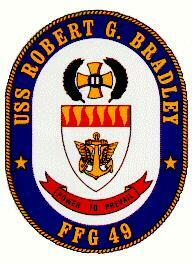 The Crest: The cross is gold, symbolic of excellence and glory, and refers to the Navy Cross awarded posthumously to Lieutenant Bradley for his supreme effort and ultimate sacrifice in the battle to salvage the PRINCETON. The two bars at center are white for purity and nobility of purpose, recognizing the fact that Lieutenant Bradley, although aware of the imminent danger, returned to the abandoned ship a second time with a salvage crew. An explosion touched off by the flames took their lives. The palm branch on either side of the cross symbolizes the courage displayed by Lieutenant Bradley in leading the salvage effort aboard PRINCETON. 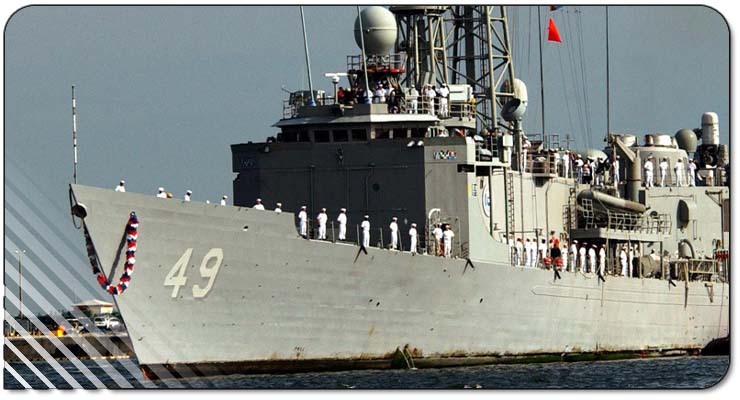 Motto: The motto "Power to Prevail" refers to the capability of USS ROBERT G. BRADLEY to engage and neutralize at-sea threats.